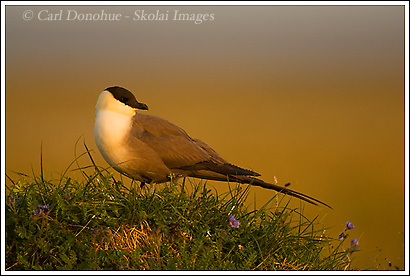 Long-Tailed Jaeger, Arctic National Wildlife Refuge, Alaska. I just got back in from a long and really cool trip to the Arctic National Wildlife Refuge – awesome place! This is a photo of a Long-tailed Jaeger, sitting on a small mound on the coastal plain, taken around 1:00am; gotta love that summer arctic thing! I’ve got about a million things to do, so this is just a quick short post – but do stay tuned. I have some ground-breaking stuff here, new, never before taken photos from the Refuge, and some discussion that will likely amaze a number of readers – the Arctic National Wildlife Refuge is a topical place right now, with the oil prices, and all, and I’m sure you’ll find some of my findings very interesting, maybe a little disturbing (or disturbed), and even surprising. This entry was posted in Alaska, ANWR, Birds, Wildlife on July 15, 2008 by Carl D.
Sounds like you got some amazing stuff – I’m looking forward to seeing it! Congratulations on a successful trip. Can’t wait to see more. Then again, this can’t be from the refuge, it is a barren, worthless piece of wasteland – why bother to project it. 😉 I can’t believe we are about to go… what … Round 4 or 5 with this again?? Oh, it’s ‘amazing stuff’ alright – you’ll see. 🙂 Stay tuned. Hey Carl, glad you’re back. I really stoked to see & read all you have. I hate waiting, especially if you know it’s going to be good! !